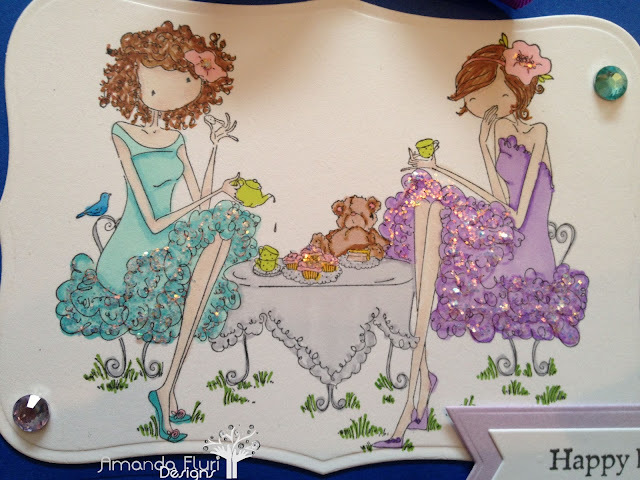 Cards by Amanda Fluri Designs: Bellarific Friday...Anything Goes! Its been a while since I've posted on here! I know I promised I was going to try and post every week, but sometimes you just can't help it, life gets busy and there never seem to be enough hours in a day. I am excited to be back though and hope that this kick starts me posting a lot more frequently from here forward. I am so excited to share my Bellarific Friday card with all of you. This weeks challenge was ANYTHING GOES! I love these challenges! The possibilities are endless! I designed it for a friend to give to her sister-in-law for her birthday, and I just love the image I thought that it was perfectly suited for a birthday card! Sometimes I share a little bit of thought process behind my cards, so I'll share this one with you. When I first picked the image usually I will pick pattern papers and then colour based around them so that I know that I am getting a really good match for colours, however this time I did it backwards, and it paid off. Usually its a disaster if i pick the papers after, but thankfully this time it wasn't. I am so thrilled with how it turned out. I also couldn't resist the amount of sparkles I used on this card. Which girl doesn't love to get a card covered in sparkles? I don't know about you but I DO! Here's the front view of the card...I apologize its a little fuzzy, I just couldn't get it to photograph properly. Here's the side view of my card...it shows a lot more of the dimension that this card has. Acrylic Block - used to mount the stamp to in order to stamp it. Paper Trimmer - used to cut the straight lines for the background paper and the card. The embellishments (gems) used on this card I cannot find a source for. Doodle Bug Sprinkles would work fantastic for this as well. Additionally all of the papers (pattern and solid) used for this card were from my scrap drawer, so no sources for them either. Sorry!